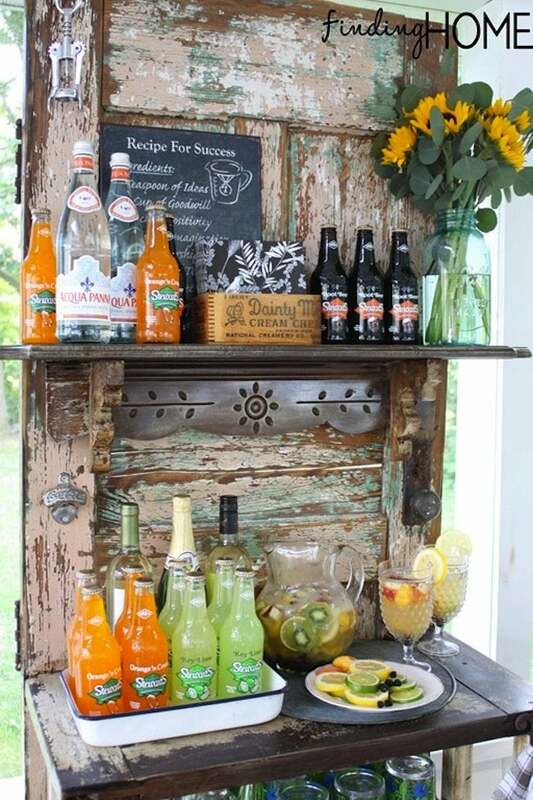 Dive into the exciting world of architectural salvage to surface the materials for this summer DIY—the perfect complement to a backyard BBQ. If you’re like us, spring and summer can mean long, thirsty hours spent DIYing (or even relaxing!) in the sun. 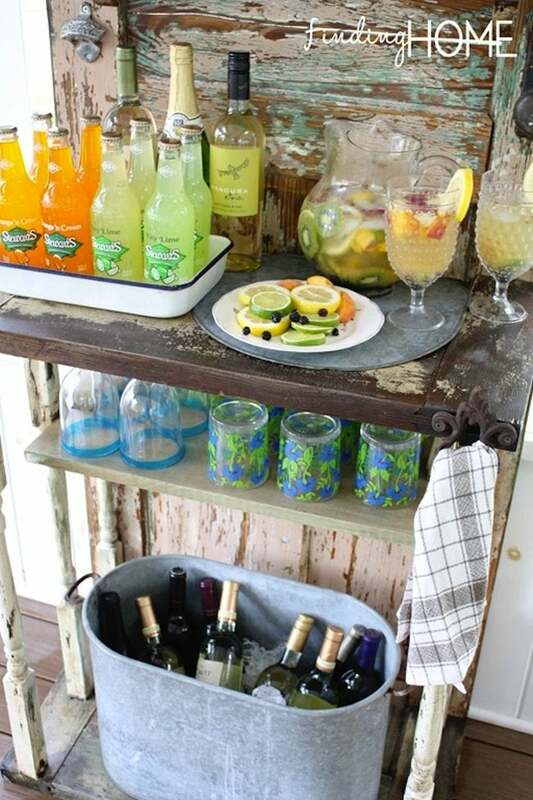 But this vintage door-turned-patio-bar is the perfect remedy to serve parched family and friends. 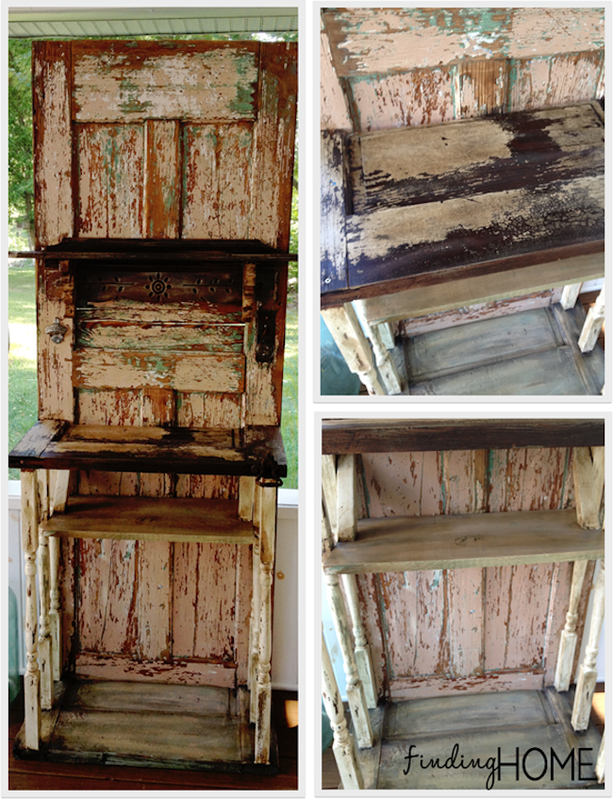 Laura, from Finding Home Online was tired of dusting off an old card table to serve her guests so she used a little ingenuity and an old yard sale door to bring this imaginative piece of furniture to life. Read on to see how she did it. Especially since our items were all vintage, we power washed everything first. We used a large piece of plastic underneath to collect any particles that fell off that could be dangerous to our sweet puppy. We then sanded everything down with a hand sander. Begin assembling your parts. We laid the door down on two saw horses and then used right angle braces to line up the bottom shelf first. We came from underneath, drilled pilot holes and added screws from the back side of the door. We added the spindles next by measuring out the spacing, drilling pilot holes and attaching screws from underneath. Since the back spindles touched the door we also drilled some screws from the back to strengthen them. Using the right angle braces again, we attached the top shelf with screws from the back and straight down into each spindle. We then added a new wood shelf underneath. We cut sections of additional spindles at a 45 degree angle, but any scrap wood would work. 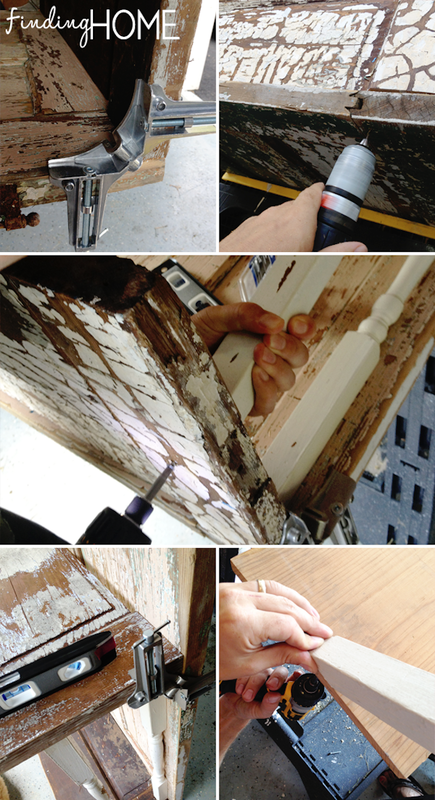 We drilled from the underside of the shelf to attach the bracket to the wood. We drilled in again from the back directly into the shelf and into the bracket as well. Once it was all assembled, I did some dry brushing of paint on the spindles (they looked too new), the plain wood shelf and the bottom shelf (it was a little too high in contrast). 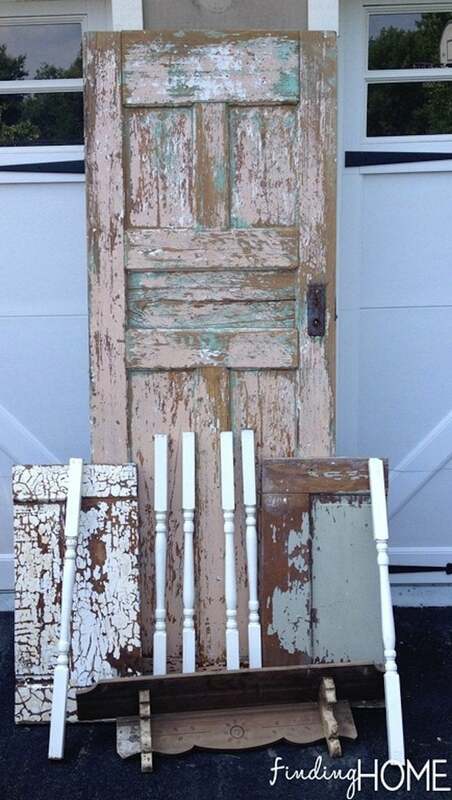 I layered a few colors of chalk paint to best blend with the rustic finish of the door. Then I covered the spindles and all of the shelves in Annie Sloan’s dark wax. This gave an aged looked to the newer pieces, sealed the surfaces and unified all the pieces together. Because this piece is designed to be outside I was concerned that the wax finish might take a beating in the heat. To combat that and to seal the old finish of the door, I finished the whole piece in two coats of a spray poly. And now you just need to move her in where you want her to go. I would suggest using some sort of anchor to ensure it doesn’t tip over. Thans, Laura! For more great DIY ideas, head on over to Finding Home Online.